Acids and bases are ubiquitous in chemistry. Our understanding of them, however, is dominated by their behaviour in water. Transfer to non-aqueous solvents leads to profound changes in acid-base strengths and to the rates and equilibria of many processes: for example, synthetic reactions involving acids, bases and nucleophiles; isolation of pharmaceutical actives through salt formation; formation of zwitter- ions in amino acids; and chromatographic separation of substrates. 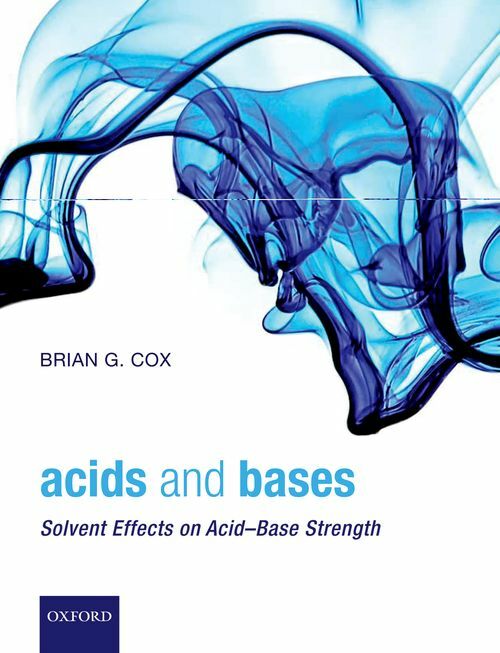 This book seeks to enhance our understanding of acids and bases by reviewing and analysing their behaviour in non-aqueous solvents. The behaviour is related where possible to that in water, but correlations and contrasts between solvents are also presented. Fundamental background material is provided in the initial chapters: quantitative aspects of acid-base equilibria, including definitions and relationships between solution pH and species distribution; the influence of molecular structure on acid strengths; and acidity in aqueous solution. Solvent properties are reviewed, along with the magnitude of the interaction energies of solvent molecules with (especially) ions; the ability of solvents to participate in hydrogen bonding and to accept or donate electron pairs is seen to be crucial. Experimental methods for determining dissociation constants are described in detail. In the remaining chapters, dissociation constants of a wide range of acids in three distinct classes of solvents are discussed: protic solvents, such as alcohols, which are strong hydrogen-bond donors; basic, polar aprotic solvents, such as dimethylformamide; and low-basicity and low polarity solvents, such as acetonitrile and tetrahydrofuran. Dissociation constants of individual acids vary over more than 20 orders of magnitude among the solvents, and there is a strong differentiation between the response of neutral and charged acids to solvent change. Ion-pairing and hydrogen-bonding equilibria, such as between phenol and phenoxide ions, play an increasingly important role as the solvent polarity decreases, and their influence on acid-base equilibria and salt formation is described. Dr Brian G. Cox was educated at the University of Melbourne, followed by academic research or teaching posts at the Australian National University, the University of Stirling, Cornell University, and the Max-Planck Institut fur biophys. Chemie, Gottingen. He subsequently held industrial positions of Corporate Research Associate with ICI and Syngenta, and Associate Principal Scientist and Consultant with AstraZeneca. In addition, he has held Visiting Professorships at the Universities of Surrey, St Andrews, Bologna, and Chieti, and University College, Dublin, and most recently acted as Senior Advisor in Chemistry at the Institute of Chemical and Engineering Science in Singapore.